Claudio Pizarro's early second-half goal set Bremen on their way to a win at Augsburg. 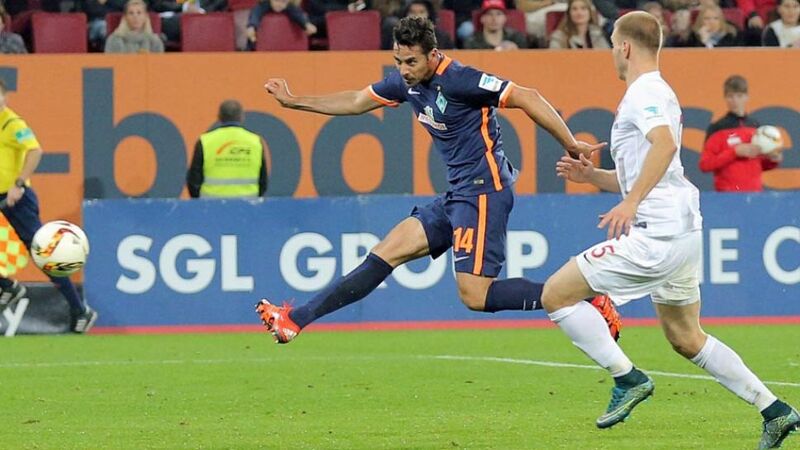 Claudio Pizarro came off the bench to score his first goal since his return to SV Werder Bremen and help his side to a 2-1 win at FC Augsburg on Sunday. With confidence in short supply on either side, 'caution' was the watchword before the break. Raul Bobadilla, fresh from a midweek Europa League hat-trick, chipped the advancing Felix Wiedwald only for Jannik Vestergaard to race back to clear. Fin Bartels drilled the visitors' best first-half chance goalwards, but Marwin Hitz parried. Wiedwald's parry from Ja-Cheol Koo kept things level before Pizarro, who came off the bench for Anthony Ujah at half-time, quite brilliantly volleyed home Santiago Garcia's diagonal pass. Bartels produced an equally emphatic finish after Zlatko Junuzovic had squeezed the ball through to him to give Viktor Skripnik's men a welcome three points, despite Paul Verhaegh pulling one back from the spot late on after Ulisses Garcia had been penalised for handball. Aged 37, Pizarro may no longer have the legs required to play a full 90 minutes of Bundesliga football, but his finish – right out of the very top drawer – shows he can still make a valuable contribution. Following their midweek European exertions, are Augsburg being stretched too far? They certainly looked short of sharpness and freshness. Pizarro now has 177 Bundesliga goals from 392 top-flight appearances, cementing his status as the Bundesliga's leading all-time foreign scorer.Bremen have earned 10 of their 13 points this season away from home.Augsburg have not won in seven Bundesliga outings.Pizarro has scored in 15 of his 16 Bundesliga seasons. Only ten players in top-flight history have scored in 16 campaigns.